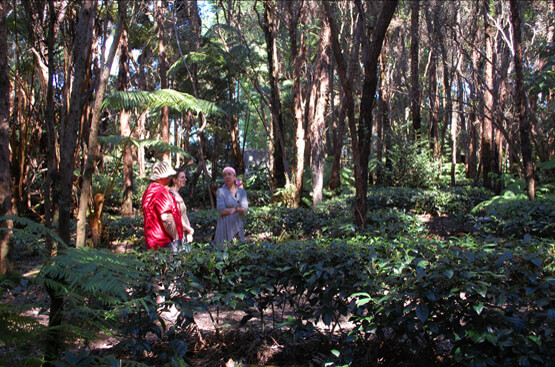 Two weeks ago, a small contingent of us from Arbor Teas headed to the big island of Hawaii to see what this exciting new tea growing region had to offer. Many suggested that a trip to Hawaii was simply an excuse to dodge the relentless cold and snow of southeastern Michigan’s winter. They were, of course, partly right. But after adding a couple exceptional green teas from Hawaii’s Mauna Kea Tea Farm to our catalog several months ago, we had other motivations, too! At Arbor Teas, we’re regularly challenged by our customers to track down new and interesting organic teas from exotic locales. At the same time, we’ve seen increasing interest in domestically-grown sources of organic tea. It’s fascinating to think these seemingly opposite trends led us to the same place - aloha, Hawaii! 3) Deepen our knowledge of tea growing by spending time with (and, in some cases, working beside) growers who are still in the relatively early phases of tea farming. Happily, we were remarkably successful on all three fronts! Hawaiian agriculture has seen dramatic shifts in recent years - many for the worse, unfortunately. For over a thousand years, Hawaiians were able to produce enough food locally to support a population exceeding one million people. But with the introduction of large-scale agriculture and global trade, increasing reliance on a diminishing number of crops has led the islands to a fragile agroeconomy. In a place as fertile as Hawaii, it is shocking to know that 85%-90% of their food is now imported. Hawaii is perhaps most known for its production of foods like Kona coffee (yum! 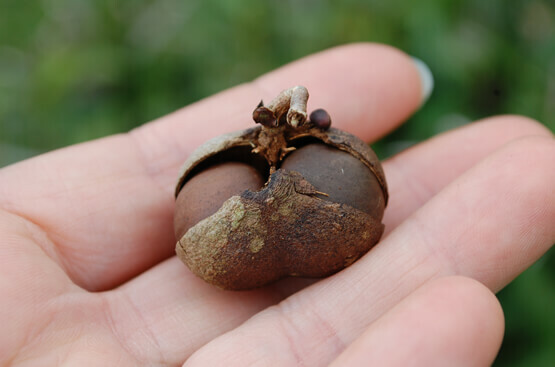 ), macadamia nuts, and exotic fruits. But one of its largest commodity crops - sugar cane - has slowly left the island over the last couple decades to be produced more cheaply elsewhere. This has a lot of folks worried about the future of Hawaii’s agricultural economy, many of whom are looking to new crops, like tea, to shore things up. And it’s no wonder - Hawaii provides an awesome environment for tea growing! Few places seem so lush and full of life. And the big island possesses volcanic soil of the perfect acidity, plenty of moisture (at least on the east side), and mountainous terrain offering countless microclimates. Can you say terroir? Tea growing on the big island really only started in earnest over the last 12-15 years, with early support and encouragement from folks at the USDA and University of Hawaii. And since it takes a minimum of four to five years for these beloved plants to achieve meaningful production, Hawaii-grown tea has only been available for a handful of years, and in very short supply. The remarkable agricultural setting offered by Hawaii has given rise to several pioneering farms, four of which we visited during our recent journey. They included Onomea Tea Farm, Big Island Tea, Tea Hawaii & Company, and (of course!) Mauna Kea Tea Farm. 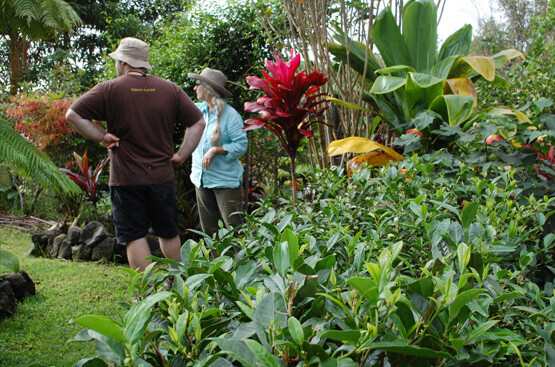 Just north of Hilo, HI, on a bluff overlooking Onomea Bay, lies the Onomea Tea Farm. In spite of it’s relatively low elevation of 200 feet, it is a top contender for the most picturesque destination on our itinerary - you can literally watch whales passing in the waters nearby, right from the tea fields! Proprietors Rob and Mike very graciously toured the property with us, showcasing not only their certified organic tea operation, but also their efforts to return the property’s other vegetation to a more natural state (so sad to see how much of the island was overrun by exotic invasive plants). 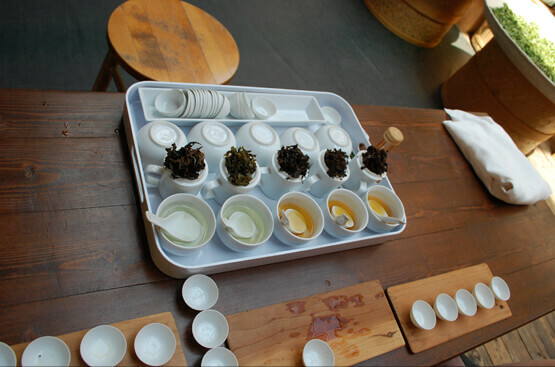 We sampled four of their delicious teas with them - gong fu style - ranging from green to black, including a wonderfully-aromatic oolong that held up nicely to multiple infusions. Northeast of Volcano, HI, nestled amidst vast preserved forest land at 2800 feet, we found Big Island Tea. In addition to touring their lovely property (much of which they’re in the process of re-foresting), we had the pleasure of helping proprietors Eliah and Cam around the farm. All the while, they shared their tea knowledge and enthusiasm for farming with us, including their passion for ecology and genetic diversity. After “earning our keep” a bit, we lunched with them and sampled a few of their teas - strictly black teas - once again, gong fu style. This was a particular treat, as Big Island Tea’s entire production is purchased and sold by Harrod’s, London’s most famous high-end department store. We felt luxurious, indeed! At roughly 4000 feet, Tea Hawaii sits at the highest elevation we visited. Their growing occurred both under the forest canopy that covers much of the property, as well as areas that were considerably more open. It was fascinating to see how the different varietals grown there reacted to the different environments available on the farm. At the end of our stay, Eva cupped a variety of teas: white, green, oolong, and two blacks, one from her farm as well as another made from leaves grown on another farm in the area. All were delicious. Like many of the growers we met, proprietor Eva Lee is a strong advocate for the growth and development of Hawaii’s tea trade. 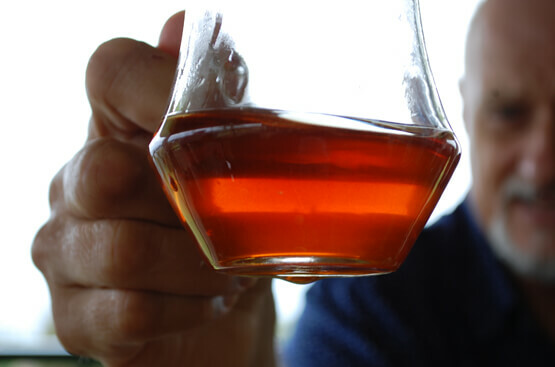 She emphasized the difference between “Hawaiian tea” (a botanical relative of the nettle plant indigenous to Hawaii, called mamaki), versus “Hawaii-grown tea” (tea made from the plant Camellia sinensis specifically grown and manufactured on the Hawaiian islands), versus Camellia sinensis tea imported from abroad and marketed by companies in Hawaii as “Hawaiian Tea”. I'm sure we'll hear more about efforts to define and protect the identity of Hawaii-grown teas. 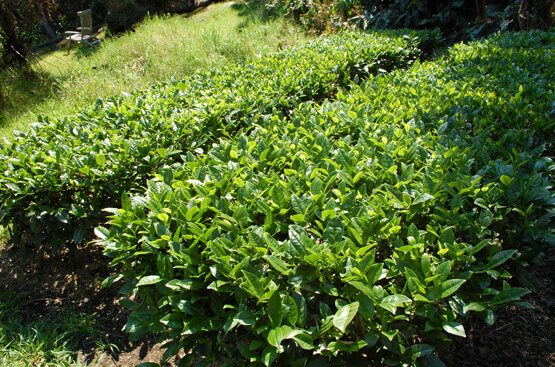 Mauna Kea Tea Farm produces our Organic Hawaii Premium Green Tea and Organic Hawaii Sweet Roast Green Tea. Located at just over 2000 feet elevation on the north side of the big island, Mauna Kea was the largest of the farms we saw, both in terms of the number of plants as well as total cultivated acreage. They had a variety of plots at different stages of growth, which gave an interesting view into the evolution of their farm. After a leisurely tour of their beautiful farm, we spent literally hours cupping teas with husband and wife team Taka and Kimberly, along with their beautiful children. In addition to sampling their “official” offerings (Premium Green, Spring Green, Sweet Roast, and Oolong), they had some special surprises up their sleeves for us. These included a brilliantly green first flush, a tightly-rolled, tippy green tea Taka called “Hawaiian Sand” that was rich and pungent, and more. Perhaps most noteworthy was his latest batch of Premium Green that was a mere 12 hours old! We’ve NEVER had tea so fresh! We were so grateful for the generosity, hospitality, and friendship offered by all the growers we encountered on our trip, and can’t wait for the next opportunity to visit them! 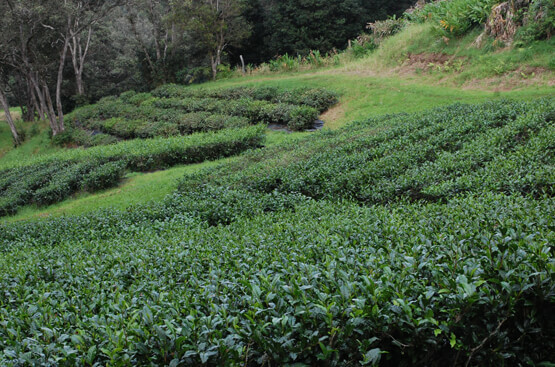 4) Some farms prioritized growing classic “known” varietals of the tea plant (e.g. bohea, yabukita, etc. ), while others are seeking to create new strains more uniquely suited to the big island. One thing all of the farms shared in common, however, was their stewardship of the land. Even the farms that weren’t certified organic took great pains to nourish the soil through aggressive composting, and to work *with* the natural landscape instead of against it. Definitely our cup of tea! You can believe that we’ll watch with rapt attention and great enthusiasm as the Hawaiian tea industry continues to flourish!